STANITSYA LUHANSKA, Ukraine -- In the cold, early morning, Red Cross volunteers bring wood and start a fire at the small temporary building that provides warmth and comfort on the edge of the front line. Nina Alexandrovna's house got destroyed due to shelling beside the crossing point Stanitsya Luhanska. The ICRC helped her to rebuild the house. 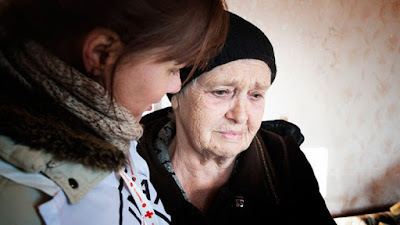 On the other bank of the Siverskyi Donets river, at a similar building, other Red Cross volunteers do the same thing for people on the other side. The line of contact between Luhansk in Ukraine and Stanytsia Luhanska, just across the Siverskyi Donets river, is a vital road of commerce. For years, villagers to the river's north have been growing vegetables and fruits and preparing meat and dairy products to be sold in Luhansk, a city of 400,000. Today the products can cross the line only at this checkpoint. Men for hire help those who cannot carry their goods over the bridge's broken steps. "Here people are accustomed to paying for everything," said Nina, a Ukrainian Red Cross Society volunteer. "That is why when a queue builds up in front of our trailer, we invite people to come in, warm up and have a hot tea. Not everyone agrees, as they do not believe it is free." About 6,000 people cross the checkpoint a day, 300 of whom stop at the Luhansk heating point. It is a busy season for the volunteers: many visitors are cold, others need a snack, and some have diabetes and need to administer a shot of insulin. "I have a sister living in Luhansk," said Nelia, a 73-year-old resident of Stanytsia Luhanska. She takes off her gloves and warms her hands by holding a glass of hot tea. "I visit her every week, and I certainly stop by here, both on my way there and back. In autumn I was afraid. What would I do in winter at minus 20 degrees, just freeze? And I never dreamt that someone would put this little house where one can get warm and drink tea." The volunteers offer health care, tell travelers what documents are required to cross to the non-government controlled territory, and often explain that the visitors can get assistance from the ICRC. Five hours to the west, the same line of contact separates Svitlodarsk, a town controlled by the Ukrainian government, from Debaltseve. The town is small enough that most people had the phone number to the hospital memorized. During hostilities it treated the wounded and those who were simply scared. "I remember once we took to the hospital a man whose house had been hit by a shell," said Olena, a nurse. "He was paralyzed with fear, screaming all the time. We did our best to help him – all in vain. He responded to our questions with the same thing: 'It's scary, it's scary!'" "And once a shell landed next to the hospital," her colleague, Natalia, continued. "And we carried the wounded to the basement. It was difficult and dangerous, and we had to act very fast. And then, when every second counted, a woman clutched in my hand and shouted: 'Just don't leave me!' That's when I realized that each hospital should have a psychologist." One recent frosty morning Olena, Natalia and 11 hospital staff met with an ICRC team conducting trainings in psychosocial support. Farhana Javid, an ICRC delegate, muffled up her face with a scarf and joked about her fear of Ukrainian frost. What if her eyes suddenly freeze at minus 20? The cold weather chit chat soon gave way to a story about how friendly Ukrainians can be. "Here people are very responsible and strive to help each other," Farhana said. "That is why we need to explain to them what stress is and how to deal with it. Only after that they will be effective in helping others." The hospital staff admit they were initially skeptical about such a training. "You know, we used to be pretty callous," Natalia confessed. "A patient would come, and instead of telling about his problem he starts sharing his feelings. It was just annoying. Now we understand that people need to speak out, that all the people here are under stress." Doctors today do not face the complicated medical cases they saw during hostilities. But psychological needs have increased. The line of control lies within view of the hospital, and residents are in constant fear of renewed fighting. The hospital staff see violent outbursts from patients, but others offer only apathy or bitterness. The ICRC trainers take this into account when talking about how to identify and help those suffering from stress. In the small towns of eastern Ukraine, going to the psychologist is not a common practice. Yet, there are no in-house psychologists in the hospital, and that is why the doctors and nurses listened carefully to everything the ICRC trainers said. "I remember sitting in the basement, the shells exploding somewhere on the ground. So scary!" Olena says. "And then people approached me and started telling something, I thought: 'What do they want from me?' It is already so scary now, and they approach me! But now I understand everything, and most importantly, I know how to manage these processes."